Session Report: EU Taxation Policy: Which impact on EUs attractiveness and competitiveness? On May 23 key stakeholders and political decision-makers focused the discussion on how to tackle tax avoidance and arbitrage. An important part of the discussion detailed how to target the digital economy. Finally, the speakers debated the VAT in Europe and how to make it a more efficient system. Below you will find a full summary, prepared by Dods. Alain Lamassoure (EPP, FR) thanked the organisers for the event. He expressed his doubt that the EU was in the process of developing a global taxation policy. Regarding the preoccupation of the European Parliament, the EU budget is the main concern. With the "own resource", the EU is supposed to organise taxes but "the result of the MFF is a disaster as if 28 Thatchers made the agreement". The proposal of the Commission will be closely looked at. One of the other main important issues is the CCCTB (Common Consolidated Corporate Tax Base) project to harmonise taxation in the EU to ease the industry. It is also aimed at tackling unfair taxation among Member State, which will need a common European tax framework. The third concern is to tackle the challenge of new business model regarding taxation, which tends to avoid direct taxation. For the Parliament, amendments were made to complete the proposal of the Commission on the CCCTB. Pierre Moscovici, European Commissioner for Economic and Financial Affairs, Taxation and Customs, thanked the EBS for the invitation. On the EU comprehensive tax policy, he said that a good system needs to be fair and support growth, job creation while being environment-friendly. The tax system needs more fairness regardless the model and the size of the companies. A lot has already been made at the EU level and he also thanked the OECD for the great job made at the international level. A common framework of anti-avoidance rules is being implemented and cooperative and uncooperative jurisdiction are being listed for the first time at the EU level. The process is working well with third countries in his opinion. He guaranteed that those issues are high on the agenda at both the EU and national level. To him, business needs simplicity and certainty. Those reforms will also need to remove competitive disadvantages. He then mentioned the willingness of the Commission to reform the VAT system and the implementation of the CCCTB as being the two most important steps for a good and modern tax system in Europe. In the short term, a tax of 3% will be implemented on digital revenues. He hoped for an international and European solution, as it would be legitimate having the single market and the monetary union. It is about being more competitively together, not against each other. He added that he was looking forward to the upcoming discussion on those issues. The Hon. Tara Rivers (Minister of financial services, Cayman Islands Government) thanked the EBS for the invitation to this panel. She mentioned that the EU Council did not mention Cayman as a non- cooperative jurisdiction. The Cayman regime has a long history of cooperation with the European and international authorities. Cayman was an early adaptor of the OECD system. She detailed that Cayman has the same rating as Belgium and Germany for example. On the listing initiative, the Cayman Islands are looking for more discussion with the Commissioner. She added that there is yet no discussion on several aspects of taxation definition and it will be requested to improve the international system. She hoped that sufficient economic standard will be applicable taking into consideration the existing different regime. The Cayman Islands have never used an evasive tax regime in her opinion and it allowed the country to raise 25% of the GDP in taxes. The country promotes taxes compliance and is strongly supporting the EU initiative as well as others existing. The role of Cayman in the financial environment is to enable the deployment of financial resources around the world while allowing the pooling of resources and safe investment. Those standards are similar to those applied in the EU. She thanked EBS again for the invitation and the audience for its participation. Jeffrey Franks (Director IMF Europe) began by mentioning that Europe has been experiencing a strong recovery since the crisis of 2008 despite a lagging investment rate. It is a productivity challenge and he added that the tax system should be an incentive toward investment and research. It should not only be encouraging the strongest but also be fair to all actors equally. This should also include protection regarding tax fraud, evasion and arbitrage. Tax arbitrage is a huge loss for the EU. He said that tax convergence should be introduced into the VAT system, which will reduce illegal behaviours. Zombie firms are also a challenge as they do not promote activity in Europe. In his opinion, the digital trade is also a challenge for inter-jurisdiction cooperation. Pascal Saint-Amans (Director of the OECD Centre for Tax Policy and Administration) stressed that international cooperation is still limited in the G20 for example but tax cooperation should develop through the fight against the arbitrage. It is not up to companies to decide where they are taxed in his opinion. Those agreements will need to gather all countries, especially at the European level. The impetus to level the playing field is ongoing, he added. The EU needs to be here more than a regional grouping and made major changes in the past few years. Some challenging aspects are still remaining such as tax sovereignty which translates into unanimity. This system is creating difficulties and does not facilitate progress. He added that the EU needs a consistent position on digital taxation. The second challenge is to provide a safe environment for investors. Finally, the EU should design tax policy at both EU and national level to promote efficiency and fairness. Hans van den Hurk (Professor of European Corporate Income Taxes and International Tax Policy/Strategy, Maastricht) wanted to make a few critical statements. He began by analysing that fair taxation does not mean equal taxation. The system is not fully perfect but on the main issues, the direction has really changed. Back to the EU, he explained that the EU is far from perfect. The EU does not cover all issues such as investment houses for example. It is striking in his opinion that both the European Parliament and the Commission are ignoring this problem. The CCCTB is a degraded tax line and is far from being fair in his opinion. It does not promote nor apply fair values. The budget is getting much more important and should be founded by the CCCTB revenue at the 3% of the state's payment. The use of social media by EU institutions is also striking as those companies are foes of taxation harmonisation. The EU needs more common sense and the European Parliament should stop making wrong statements in his opinion. Krister Andersson (Chairman of the Tax Policy Group, BusinessEurope) mentioned that the work is not equally weighted among member states. There are still instances of Base Erosion and Profit Shifting (BEPS) and it is important to correct the situation. The magnitude of BEPS is small but it has to be tackled effectively. He added that the world is moving rapidly and more competitiveness is required as the US is also reforming to promote growth. Europe needs to become more competitive to counter this trend. A global agreement on taxation principle is also missing and targeting the digital is not the way forward. The EU needs a more global solution. The aim is also to create a debate to influence the future changes. The Commission also needs to make the member states more compliant in the VAT area, where companies are truly struggling to obtain certainty. Serge Krancenblum (President of the Investment Facilitation Forum) thanked the Commission. He represented the industry of the investment services. He hoped that the debate on taxation reforms will be over soon as all methods to avoid tax will be blocked. The system needs converters, to help to invest even in difficult countries in his mind. He mentioned his willingness to be a gatekeeper against money laundering. He added that he was happy to do that job and detailed that investors are part of the solution against investment houses. Sasha Vakulina (Euronews, Moderator of the meeting) asked the Commissioner about his point of view regarding the continuation of the digitalisation of the economy. 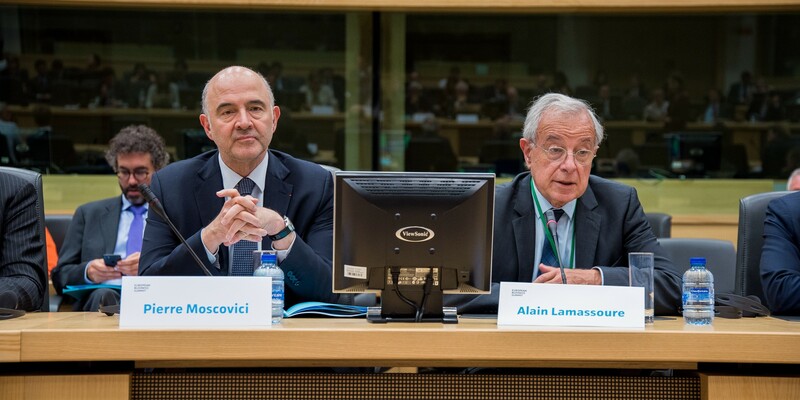 Pierre Moscovici, European Commissioner for Economic and Financial Affairs, Taxation and Customs, answered that the EU has to tackle this issue. There is the question of efficiency and fairness as the status quo is not good enough. The international approach is the one to undertake in his opinion. The EU needs to go beyond the public debate to have a fully functioning system. The EU must also ensure that the member states are acting together and avoid any competitive system inside the EU. Sasha Vakulina (Euronews, Moderator of the meeting) asked Pascal Saint-Amans how to act at the global level. Pascal Saint-Amans (Director of the OECD Centre for Tax Policy and Administration) said that an agreement is needed urgently. Everyone agrees on the problem but not on the solution. First, digital economy is not a stabilized concept and refers to very divergent business models. Countries also defend very different interest. This is the main challenge, to obtain a consistent voice to build agreement. It is not only a BEPS issue as some activities are not located in any jurisdiction. There is a lot of work to do and some countries will have to think twice. It could also help companies to be more cooperative. The Hon. Tara Rivers (Minister of financial services, Cayman Islands Government) stressed that the system is an investment hub which does not avoid tax shifting. There is no incentive to do so in the Cayman Islands regarding her opinion. Policies need to be developed on facts and not on reputation. Hans van den Hurk (Professor of European Corporate Income Taxes and International Tax Policy/Strategy, Maastricht) added that data will be highly valued in this area. To him, there is no difference between digital or old fashion companies. All of them should fall under the jurisdiction. Sasha Vakulina (Euronews, Mediator of the meeting) raised the question to Jeffrey Franks on how to challenge the digital economy. Jeffrey Franks (Director IMF Europe) answered that a balance needs to be found without excluding other activities. We don't want to be taxed differently to other businesses, he added. He mentioned that the market should be the only one to decide which company is growing or not, not the taxation system. Sasha Vakulina (Euronews, Moderator of the meeting) finally asked Alain Lamassoure what is the biggest challenge for 2020. Alain Lamassoure (EPP, FR) expressed his concern about a short-term solution, which will delay the emergence of the long- term solution to tackle digital economy. He urged to focus on the long-term issues.